Technology has made us more mobile than ever, yet working on a laptop is often uncomfortable and inconvenient. That’s where iSkelter comes in. 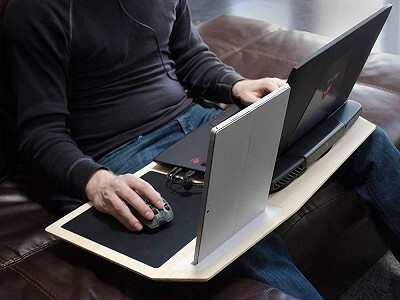 They’ve designed multifunctional, visually appealing lap desks that let you work on a laptop almost anywhere. 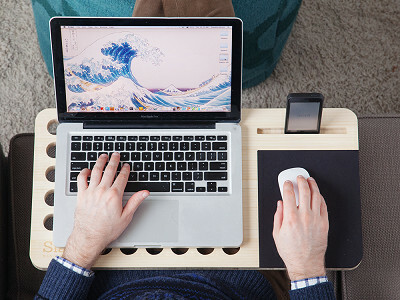 Made of bamboo, iSkelter desks are both functional and portable. The air vents keep your computer—as well as your lap—cool, and the desks are designed to improve posture. Whether you’re just looking for an elegant laptop stand or a more complete workstation with a mouse pad and mobile device dock, iSkelter has an option that will work for you. 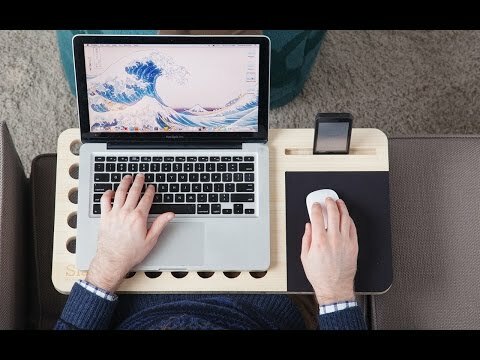 Founder David Stuebe struggled to find a lap desk that worked well and was as aesthetically pleasing as his Mac, so he decided to create one. Made in the USA, iSkelter desks and stands are as beautiful as they are practical. We love art, printing, and building things. If we don't have something to design or work on, we find something to take apart just to put it back together again. As a result, our products are made in America and by people who give a damn. Feel free to reach out with any questions. Hi - curious: what prevents the laptop from slipping off the desk? Also, when you specify left- or right-handed, do you mean the location of the mouse pad? The Slate sits pretty flat on your lap and even with it being slightly titled, the rubber feet on your laptop hold in place pretty well. We haven't had any complaints about laptops sliding off. If you click into the Grommet page for the Slate Mobile Lapdesk you will see the left hand and right hand options for the mousepad. what size computer will this hold? @Susan The Slate will hold a 13, 15 or 17 inch laptop. Needs a cupholder to be perfect- next gen fix. 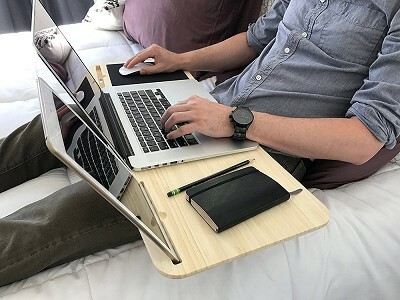 We have discussed this option in the past, but we wanted to simplify the lapdesk and we were also nervous about a drink next to your laptop :) We do make some techdesks though that also include a drink holder. @David I agree. The first thing I looked for was a drink holder. I work in a pickup with a center console. I do a lot of route surveys and need something that will not slid off console when traveling. Will this work for me? I'm left handed so this product doesn't work for me. Hi Ann, the Slate Mobile Desk comes in left- and right-handed so it does. For the Slate, we have a left handed version available. For the SlateGo, you can simply flip the lapdesk around for left or right hand use. Hi...I'm curious. 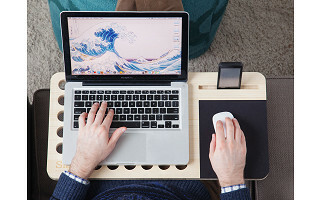 what does the bamboo desk look like. What if I just want a portable surface to put my I Pad on and even write ....snail mail...notes and letters by hand. Your photos only show the laptops on the desk, but not the desk. I love bamboo. How do Slate and SlateGo differ? Do they really weigh 5 lbs? Seems heavy for bamboo. The Slate has a mousepad and is 3/4 inches thick. The SlateGo has a slim felt pad and is only 1/2 inches thick that makes it lighter and easier for travel. 5lbs is the shipping weight for the regular Slate. The Slate is really 3.7lbs which seems heavy, but feels light when it's on your lap. This is only for short term use is that correct? I've heard that it isn't good to rest a laptop that close to your body. Comments? I'm curious, in what way is it not good... for you or the computer? Due to physical limitations, I work sitting on an adjustable bed and have had a laptop in my lap for many years. That doesn't seem to affect either me or the laptop... or maybe it is and I don't know it yet? Anyone have more info? Not good for you. I thought it had to do with Electromotive force (EMF) emissions from the laptop. I work at home four of five days a week and would rather work from my recliner than sit at a desk but have always been hesitant to do so because of the EMF issue. The fact that this item is porous only adds to that concern. I'd love to use it but only if I could so do for hours at a time. Hi Don and Danielle, this is an item that can be used for hours at a time. But you raise good points. Don, you're right in that it's not recommended to rest your laptop directly on your lap. A physical buffer like the Slate or SlateGo helps mitigate the health concerns. The porous design is for cooling as overheating is perhaps the biggest concern with putting it directly on your lap. In terms of EMF emissions, while it is a concern, it's difficult (if not impossible) to completely take away that risk unless you put your laptop on a desk or table. In terms of a portable lap desk, the iSkelter products are extremely effective in eliminating overheating and limiting direct exposure to EMF. @Barbara J - have to agree. I would love the one with the mouse holder but it's way out of my league. Have to add that it depends on plain air to keep it cool. If it's on your lap (as I always use mine), the one I have has a fan. An easel wouldn't work for me and I don't have a cell phone but it would be easier to use the mouse that's sitting beside me on the couch. The one real positive is that it's made in the USA. It is unique but far too expensive for this senior. Great, Can you please make one with fold out legs for sitting in bed. And put some no slide rubber grippy material in between the holes? then I would buy 2 . one to put my dinner on and a second one to sit behind it while I watch TV. I know. Shameful. But there it is. Life in a studio apartment. Hi Mary Linnane, thanks for the comment. I'm sure that is something David and co. will consider as they further develop their products. The concern with rubber material in between the holes is eliminating one of the key components of the Slate and SlateGo which is overheating. 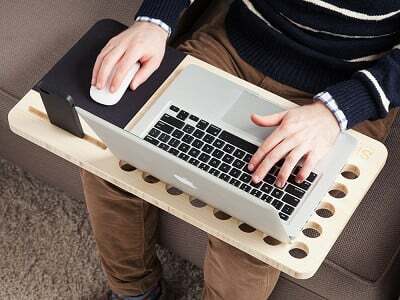 The holes allow for ventilation and keep your legs and laptop safe. In terms of your question below, the width of each hole is just over an inch and the depth is 0.5". One more question please, David. What is the width and depth of just the holy part? I have a 17 inch laptop. Thanks. Hi Judith, thanks for the comment. That is a new and great use for the Slate or SlateGo. The holes are small enough where it won't be a problem in having your checkbook fall through and the sheer pressure of writing out a check should keep the book in place. I certainly think it could work. With the holes, you ought to be able to quick-work a cup holder with legs that would fit in the holes. The center of gravity would be below the 'desk'. Size of the cup which could be held would vary. Thia way the spill would go on your feet. Hi Pete, thanks for the idea. I'm sure iSkelter will keep it in mind as it could solve the problems David mentioned above. In terms of the collapsible straw: that's brilliant. If you know of one, please send it to our Citizens' Gallery immediately. I was Scrolling through the comments to enter my idea until I saw Pete's comments and realized he'd beaten me to the punch! If you were able to find a workable design and material to use as a plug for one of the holes (I'd suggest a composite rubber that's cylendar shaped with a small ring molded into it at the bottom (so when you slide it into the hole the ring would basic snap it into place)) the Applications would be almost endless. The cupholder would be my first choice, obviously, but you could hang virtually anything of any shape over the side. Whether it was a s smartphone holder or a small clip that would prop up a notepad. Possibilities are endless. Hi Steven, thanks for the comment. It's a great idea and what I am getting from what you wrote, it sounds like it would fit seamlessly into the current design of the products. This could be the next gen version of the Slate. Stay tuned! I need a laptop desk with a clip board or some sort of paper holder that can be attached to the left of the desk. Any ideas? Hi Craig, thanks for the comment. Using velcro or some other adhesive to attach a clipboard to the Slate or SlateGo should work. If not, it's certainly an idea for our Citizens Gallery. Hi Esther, the Slate or SlateGo sound like the exact products you are looking for. They are $99 and $88, respectively. Hi Christine, thanks for the kind words. The Slate and SlateGo hold 17" laptops so I think a Surface would work great especially since the kickstand doesn't add much to the dimensions. 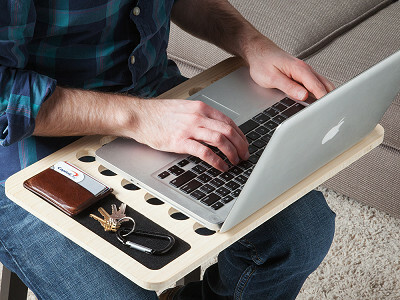 The stability these lap desks provide should keep it in one place, too.